Pickles have been around since ancient times, although there is some disagreement as to when exactly in history people started eating them. Some believe the first pickle was created in Mesopotamia in 2400 B.C.E. Others believe it was as early as 2030 B.C.E. Pickles are mentioned in the Bible and can be found in the works of Shakespeare. Explorers like Christopher Columbus and Amerigo Vespucci used pickles to help prevent scurvy amongst the crews of their ships. Napoleon offered a huge financial prize to anyone who could find the best way to used pickling to preserve food for his troops. H.J. Heinz used pins shaped like pickles to draw customers to his booth at the 1893 World’s Fair in Chicago. The U.S. government commandeered 40% of all pickles made in the U.S. during WWII so that they could be used in rations for the soldiers. Several famous people throughout history are reported to have been or to be pickle fans including Queen Elizabeth I, Thomas Jefferson, John Adams, Bill Cosby, Fran Drescher, and Ed Koch. Elvis Presley loved fried pickles. George Washington was such a fan that he had a collection of more than 400 varieties of pickles. Americans love pickles so much, more than half of the cucumbers grown in the U.S. each year become pickles. Kool-aid pickles are made by soaking dill pickles in strong kool-aid and are very popular in parts of Mississippi. A town in Michigan that claims to be the Christmas Pickle Capital of the World holds an annual pickle parade led by the Grand Dillmeister. You can hear the crunch of a good pickle at 10 paces. In early times, people believed that pickles were essential to good health and helped to maintain the right balance of acid in the body. Americans love dill pickles twice as much as their sweet counterparts and an average American eats more than 8 pounds of pickles a year. In Fiji, pickles are part of the courting process as pickle pits provide a valuable source of food in the event of a storm. Men use their pickle pits to prove they have the means to provide for a wife. In America and Canada, people prefer pickles with bumps and warts to those that are made from wartless cucumbers. Although most people consider pickles a vegetable because they are made from cucumbers, the U.S. Supreme Court has rules that they are technically a fruit, similar to tomatoes. 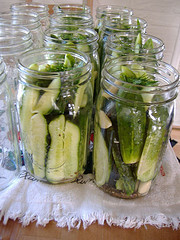 In the U.S., pickles are made in 30 of the 50 states with Michigan and North Carolina making the most pickles. Arizona has its own special pickle story, too! One family began Arnold’s Pickles right in downtown Phoenix! This entry was posted in Fun Food Facts and tagged Amerigo Vespucci, Arizona, dill pickles, Elvis Presley, farmers, fun facts, Pickled cucumber, pickles, United States. Bookmark the permalink. I really do love pickles!!!! They are definetly my favorite!